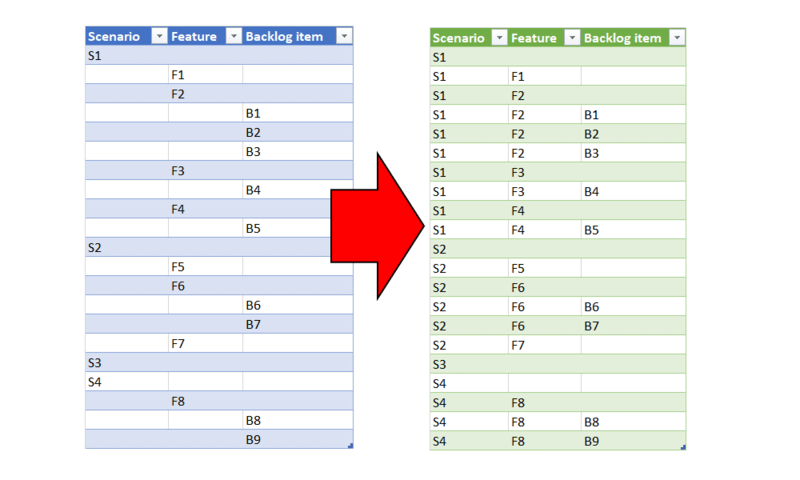 You have a table of Backlog items with three levels of hierarchies (Scenario, Feature and Backlog Item). In each row, the source data includes the unique ID of the lowest level, but has blank values in the columns that represent the higher levels, as shown at the left table. The format on the left is not ideal for analytics. You may think that it is not common to find such format. Unfortunately, it is a common format. For example, here is a screenshot from an output of Team Foundation Add-In in Excel (source is here). Can you fill down the table using Power Query in Excel or Power BI to reach the format of the right table above? Can you take your solution one step further, and write it in a way it will support dynamic number of levels and different header names? (For example: Continent, Country, Country, City, Street). You can download the source table here. The solutions will be published soon. Update (Jan 14, 2019): Thank you for the solutions you proposed below. 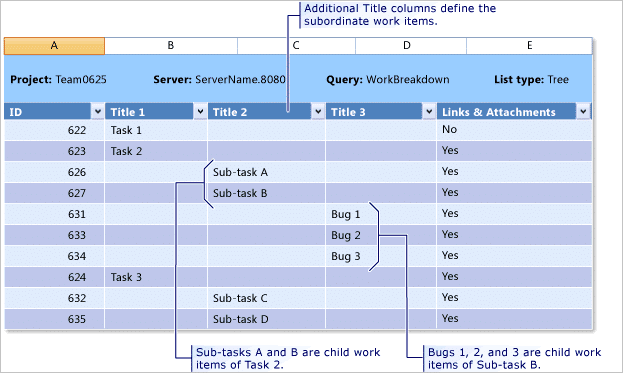 Here is a solution that receives the table and the number of hierarchies in and uses recursions to resolve the challenge, without knowing in advance how many levels of hierarchies or column names are used. In the next blog post, I will describe it in details along with the best queries that were shared below. Here’s one solution. It prevents the fill down by replacing the nulls with a temporary value – in this case “(prevent filldown)”. Thanks for the challenge Gil. Looking forward to reading what your proposed solution is. Final table matches the output requirement. I didn’t quite make it dynamic but I was getting close! I look forward to your solution. I took a subtractive approach where I replaced values with nulls after completing a filldown on the whole table. Thank you for sharing Cristian. Can you make it shorter? Look at the other solutions that were shared here. Thanks for the challenge, Gil. Import data into Power BI or Power Query in Excel. 1. Fill down the Scenario column. 2. Group the table by Scenario column using All rows. 4. Select last column and remove Other Columns. Pronto !!! You’re done ! I like FrankT’s solution, but think it would be better if ended with a step to clean up remaining empty strings that were introduced into Feature column. Looking forward to learning recursive approach. This is the M function I used to achieve the filled down table with the demoted headers step accommodating different column names assuming a similar Table structure ,( ie 3 columns) and hierarchy. About the different level of hierarchies, that became a little tricky but was almost there. As a function that can take a table of similar structure and hierarchy thanks to the Demoted Headers Step. Thank you for sharing. Try to modify this function to accept another parameter for the number of hierarchies and operate on multiple columns. I suspect that you would need to use List.Accumulate to iterate over the creation of new columns. SteveJ Thank you for sharing. I will publish your solution in my next blog post. You are welcome to contact me and publish a guest blog post to explain your code. Neat problem. Here is a solution that used recursion and group by. Jeremy, Thank you for sharing. I will publish your solution in my next blog post. You are welcome to contact me and publish a guest blog post to explain your code. Here you go. No recursion or custom functions necessary. Essentially it uses a dumb fill to populate all of the possible cells, but then gets the actual column depth for a record and removes any fills outside of that depth. Micah, Thank you for sharing. I will publish your solution in my next blog post. You are welcome to contact me and publish a guest blog post to explain your code.